Some exciting news about The Other Client List! Mark the date! Save the calendar! Save the whales! The premiere of our web series is official! February 19 at Busby’s East in Los Angeles, California! If you do Facebook, there’s the link. If you don’t, good for you- stay away! 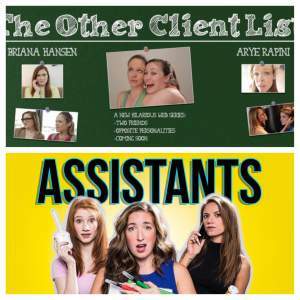 Updates on my web series, The Other Client List! Great news, OCL friends and fans. Every day we inch closer to seeing our final product go live in the world. We officially have all the cuts pretty much ready and are just doing the last finishing touches we can do at this point- final inserts we needed to grab, finishing off music, and improving the overall sound quality. Then we’re done! Can you believe it? I can’t wait to be able to write the post that announces our official premiere and the day these will be live online! There’s still plenty left to do… so we need to dig deep and finish strong. 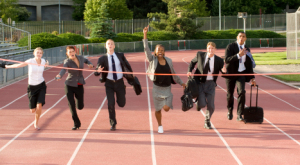 But… after all this time- it’s nice to at least have the finish in sight! Subscribe on our YouTube channel for all the latest updates and bloopers, if you so desire. Last year at this time we had just funded our web series. Now we’ve begun our marketing campaign and are delighted to have a YouTube channel that’s starting to get some really fun content up on it. Like the blooper reel below! Take some time to check it out! And let us know what you want to see! Love this article. Very true. During a recent night out in San Francisco, another performer and I struck up a conversation with a fellow bar patron. Life details emerged, and it wasn’t long before the question arose. The one all performers must navigate. The one that caused my friend to look at me, eyebrows raised, suppressing a laugh (or possibly a horror-movie-style scream). Another Metaphysical Comedy Podcast is up! Check it out!